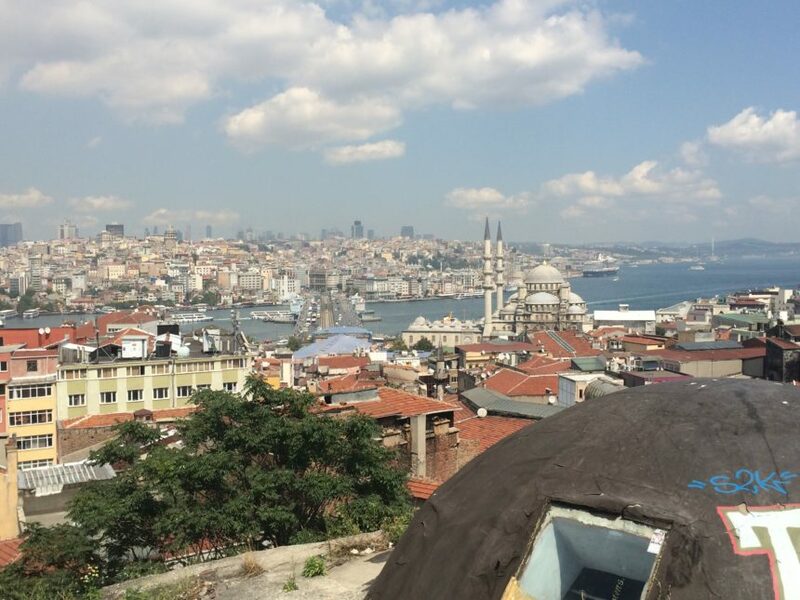 On watching my adopted city spiral:The Istanbul I moved to three years ago still had the swagger of an underdog on the rise. Back then, its not-quite mainstream status gave it an edgy appeal, perhaps enhanced by the signs of trouble—the tear gas, the refugees on the street, the slow northward creep of Syria’s vortex. But Istanbul was no Middle Eastern city; it never was. It was a playpen for the risk-averse eastern-curious; the mecca of Mideast lite. The Istanbul I moved to three years ago was Travel + Leisure’stop European tourist destination of the year, and later, TripAdvisor’sTravelers’ Choice Destination of 2014, overtaking Paris—Paris!—for the title. The Istanbul I moved to three years ago was an emerging art market, financial market and Islamic fashion market with the largest gay pride parade in the Muslim world. Turkey, then, was a retirement hub for ruddy-faced Brits who peacefully colonized the blue-flag beaches of Ölüdeniz with their gated communities and their pubs. It was a clubhouse for Erasmus kids and Ottomanist nerds; a strange Disney World for Arab families and cosmetic medical tourists, who indiscreetly devoured ice cream cones with their bandages exposed. It was the precise place to be at the precise time for journalists like me, who could live safely, comfortably, in sinful luxury on the edge of the major conflicts of our time: the rise of ISIS, the global refugee crisis, the collapse of order in Syria, Iraq, Egypt and Eastern Ukraine, and yes, the temblors shaking Turkey, as well. Of course, we knew that the center would not—will not—hold, that the wispy borders would not keep the surrounding chaos out forever, that the security and stability in which we luxuriated would be—was and is being—slowly consumed by the creeping disorder all around. We reported the unraveling turn by turn: The Gezi protests, the government corruption and consolidation of power, the censorship, the growth of ISIS in Turkey’s cities, the buildup of tension in the Kurdish southeast. We read the unrest in the local papers, in our neighbors’ faces, in the graffiti on the walls. But in that time—in all that time before the Turkey of tourists became the Turkey of U.S. State Department warnings and periodic terrorist attacks—how boundless and giant it felt. How can I describe how big and invigorating and enthralling Turkey, at that time, felt for me, a girl from the suburbs of New York, who mistakenly believed for so long that thatcity was the center of the earth? How can I describe the energy of a country that is and has been—since the times of Fatih, of Constantine the Great, of the apostles—a key crossroad of cultures and, naturally, conflict. One that accommodates— however tenuously at times—the lifestyles of the pious and secular, the migrants and jet-setting elite. In those days, in those early fleeting days, I explored Istanbul without reservation or fear. I jogged the seaside promenades that line the Marmara and Bosphorus Strait, and the burnt-orange pathways of Belgrad Forest. I got lost in the markets of Eminönü, and in the crowds of Istiklal Street and Taksim Square. By metro, dolmuş, tramway and ferry, I crossed the metropolis, acquainting myself with its shopping malls and dining, acquiring a taste for its mournful pop music and round-the-clock chai. And I fell under its spell, staring out at the cargo ships that slice through the heart of the city, between hills of minarets and orange roofs. By plane and by bus, I traveled south to Ankara and further to Gazientep, Urfa, Silopi, to Diyarbakir and Mardin—the dry, big-skied cities of the southeast, each now linked to suicide bombings, assassinations or all-out warfare in the streets. Of course, we worried these sorts of things might eventually happen. I mostly traveled to these places for work, to report on the buildup of pressure and the foreshocks of a seemingly imminent earthquake. Being a journalist engaged to a journalist surrounded by journalists, I was aware of the open flow of jihadist fighters—all beards and no luggage—to Turkey’s border towns and the war beyond. I was alarmed by a visit to the ramshackle Ankara district of Hacıbayram, where residents openly admitted to me their love for ISIS and plans to relocate their families to the caliphate. I was more alarmed by the silence of the government—so for long!—as ISIS settled itself in my new home country and apparently dipped into and out of Syria, with ease. I watched one of the first ISIS bombings to hit Turkey on live TV. Then being a different sort of time than now, it wasn’t immediately obvious what the commotion at the televised election rally was about. I happened to be in an office of the very political party the bomber targeted, and staffers there seemed as confused as I was. We looked up at the TV screen and mumbled speculations—Was somebody shot?Did a transformer blow?—before resuming our conversation about the upcoming vote. There were two bombs, in fact, planted by a 20-year-old whose family I met months later, after his hometown gained notoriety as an ISIS hub. He was brainwashed, his cousin said. There was no ISIS problem in the town, the mayor said, the imam said, the locals said. The boys were simply misguided. I heard about the next ISIS attack while I was in London. It struck Suruç, a Kurdish town I had spent a good amount of time in, and had recently left. The suicide blast targeted the same community center I had visited every single time I came to town. Where I waited in plastic chairs for interviews. Where I drank tea and ate watermelon with activists and politicians and doctors who descended on the town to help Syrian refugees seeking shelter from ISIS on thisside of the border, where things were safe. The bomber killed 34 people in that courtyard. Thirty-four people. In Turkey. Maybe I wouldn’t blink at this news today. Perhaps nobody would. But back then, when Turkey was still hanging on, when the tourists were still coming, when the storm clouds were gathering but the thunder hadn’t yet ripped, the suicide attack hit me hard. Turkey is not the Middle East; it never was. What unsettled me and many here in Turkey perhaps more than the news itself, was the reaction in the country to the bloodshed. No unity, no “we are all Suruç,” not even a consensus on whom to blame, which enemy to fight in response. The conspiracy theories reached hallucinogenic levels of crazy. Some theorized in print and on TV that Kurdish leftists carried out the attack on their own people, to sow chaos in the country, even though the government said all signs pointed to ISIS. Others called for revenge against the government for not doing enough to stop ISIS, for supporting ISIS, for beingISIS. The fault lay with the leftists, the Islamists, the Zionists, the government, the opposition, the West. As this almost-slapstick horror played out, there was a conspicuous absence of a strong voice of reason from the top, calling for unity and transparency to dispel the festering myths. And anyone watching recognized that this was the beginning of something bad—the shapeless boogeyman we worried about, suddenly starting to move. The attacks since then have become a blur. There have been about a dozen since Suruç. An ISIS bombing at an Ankara peace rally. A Kurdish rebel attack in a Bursa mosque. The window of peace that had allowed me to travel safely and easily through the Kurdish southeast simultaneously slammed shut. Kurdish rebels and Turkish security forces began killing each other once again, as ISIS piled on to the chaos. I haven’t been back to Diyarbakir or Mardin or Silopi or any of the other big-skied cities of the southeast since the fighting resumed. Journalists who do go are under mounting scrutiny and some have been deported or detained. It’s never clear exactly why, and the absence of facts breeds conspiracy theories—of surveillance and murky red lines. Not knowing what to believe, I’ve been cautious. Not that staying out of southeast and away from the Syrian border is any defense anymore against trouble. The darkness has spread; the attacks have crept closer to home. The suicide attack on Istanbul’s Sultanahmet Square killed 10 tourists just five kilometers from my house. I heard the sirens and saw the choppers circling overhead. Three months later, it was Istiklal Street, a crowded pedestrian thoroughfare that I never loved, but couldn’t avoid, however hard I tried. Blocks away from me, it was quick and easy access to clothing and electronic stores, bookshops and odds and ends. It was bars and cafes, including a favorite—one tucked in the quiet garden of the French Institute, a cultural center that closed its café to the public in the wake of the ISIS attack. Three months after that, it was my airport. Forty-three dead, more than 230 wounded at the international terminal, my gateway to family, to holiday, to the rest of the world. How many times had I waited there for my love to return? How many times had I arrived at that terminal, bubbling over with excitement for a vacation, an assignment, a visitor? Facebook, which apparently saw thatattack as a turning point, activated its safety feature for the first time in Turkey and I felt obligated to mark myself safe. (If I didn’t, would friends and family wonder, I wondered?) So I did so, thus letting my friends and family know, in case they missed it, that ISIS had attacked Istanbul and yes, specifically the airport I always use. Some had questions, and I answered: Yes, this is bad; no I don’t think it warrants any hysteria or any drastic changes of plans. Turkey is not the Middle East; it never will be. But it would be dishonest for me not to acknowledge the fact that these attacks are now frequent, and Turkey has changed. I can no longer tell prospective visitors in good faith that Turkey is perfectly safe, and roll my eyes when they raise concerns. How could I, when even I now start at loud noises, suspiciously scan crowds and avoid the metro at certain times of day? I could tell my visitors, as I tell myself, that the probability of dying in a terrorist attack is absurdly low, and that it’s more logical to worry about car accidents. But that would be dishonest, too. The probability of car accidents, as far as I know, has remained static, while the probability of terrorism in Turkey has obviously risen. The police, with their giant guns, guarding Istiklal Street are anticipating the next attack. The new metal detectors that have sprung up around the city are in anticipation of the next attack. The heightened security at the airport, at tourist sites, are in anticipation of the next attack. So how can I, in good faith, tell anyone that it’s silly to also worry about future attacks? I am confident that Turkey will eventually rebound. Its history is full of catastrophes, rebirths and transformations, and I don’t see the present turmoil doing the Republic in; transforming it into a Syria or Iraq. Turkey is not the Middle East; it never will be. But the fact is that, at the moment, things aren’t great, and the forecast is still looking grim. The Turkey I live in now is no longer the same boundless and big country I moved to three years ago. Insecurity has shrunken my space. It has taken from me my French café, my carefree trips to the southeast, my mindless wanderings through tourist districts and crowded places. My mindlessness. The creeping insecurity has taken from me visitors who might have come, and several colleagues who, under murky circumstances, were told they are no longer welcome in Turkey. It has further restricted what I will write and share on social media. It has killed the fantasies I sometime had, on those perfect Istanbul days, of staying here longer than I planned; having a kid here, buying a house. Still, much of the day-to-day remains the same. With some extra precautions, I work, I play, I travel. I listen to sad Turkish pop music and sip my coffee. I run my errands, passing the men on too-small stools, still smoking their cigarettes, drinking their chai. The families are still barbecuing on the seaside, as well; the hapless strays still begging for food. The vendors are still rattling their carts down my street, shout-singing the names of their wares—tomatoes-cucumbers-eggplant-squash-PE-peeeerrrs! The beauty of the city still overwhelms and lulls me, sometimes, to that place of comfort that existed before the spiral. The tension releases, the darkness fades, over rooftop drinks and outdoor breakfasts, on lazy afternoons floating in the sea. I wonder then how will I ever explain to my friends and family back home how beautiful Turkey is, and how I will miss it so when I go. But then, always, some reminder of the new fragility breaks the spell—the sight of a police convoy racing somewhere, the sound of choppers circling overhead, the sight of a suspicious unattended package, the sounds of shouting, commotion in a crowd. Or worse—news of yet another attack. And when it happens, everyone responds defiantly, as we’re supposed to—we will not let the terrorists win, we say— before further heightening our vigilance, and getting squeezed, retreating even, into an increasingly shrinking space.